This wedding was a big 2017 highlight for me. It was my last wedding of the year and my first as a St Bart’s Brewery Wedding Photographer. 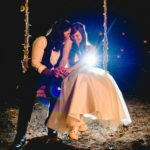 But more than that, is was everything I love about weddings – fun, laughter and of course tons of love! It was the day before New Years Eve and the there was still that lovely Christmas magic in the air. The weather also proved very kind to Lily and Greg: no rain and no wind and the streets were a very un-London-like calm. Greg and Lily currently live in the US but decided to fly home to London get married. We’d chatted over Skype to plan what they’d like photography wise and get to know each other a bit. They’re the type of people you instantly warm to and I really looked forward to their day. 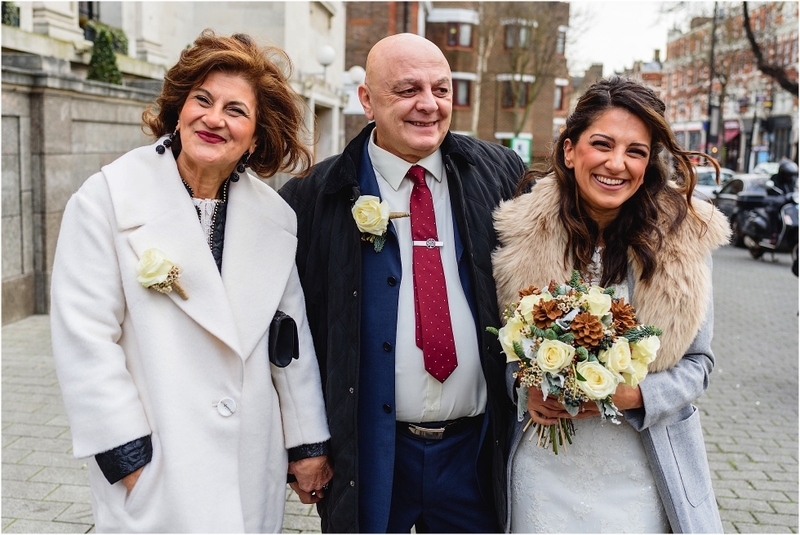 I met Greg for the first time in real life in the Vineyard pub opposite Islington Town Hall where they were to be wed. This was actually my second time shooting at Islington Town Hall. It felt really nice to revisit it after Chris & Russ’ Wedding there some time back. It’s certainly not your average town hall! Lily didn’t want getting ready photos so after a quick drink at the pub with Greg’s friends and family it was straight into the venue for the ceremony. Lily arrived with her family looking absolutely stunning. She comes from a Lebanese family and she had what I assume was a Lebanese type welcome from the women of the family with lots of cheers! Either a Lebanese welcome or just a really lovely family welcome, either or both are highly likely. The ceremony was lovely. I love that big circular room. It’s quite unusual for me to be able to move around during a ceremony but there’s tons of space there to do it without getting in anyone’s way. It was nice to be able to shoot from a few different angles. After confetti and a few quick couple shots we headed to the awesome St Bart’s Brewery. I’m actually writing this blog a couple of weeks after shooting another lovely wedding there. The staff there are so lovely! Pam, the wedding manager, is absolutely superb; caring, efficient, great attention to detail, and a good laugh too. I might love her a little bit and I’m not just saying that so she feeds me well next time I’m there 😉 Honestly – you’ll be well looked after if you have your wedding reception here. Greg and Lily, being super chilled, had a buffet rather than a formal sit down meal. It worked really well as it suited their style and the food was great! 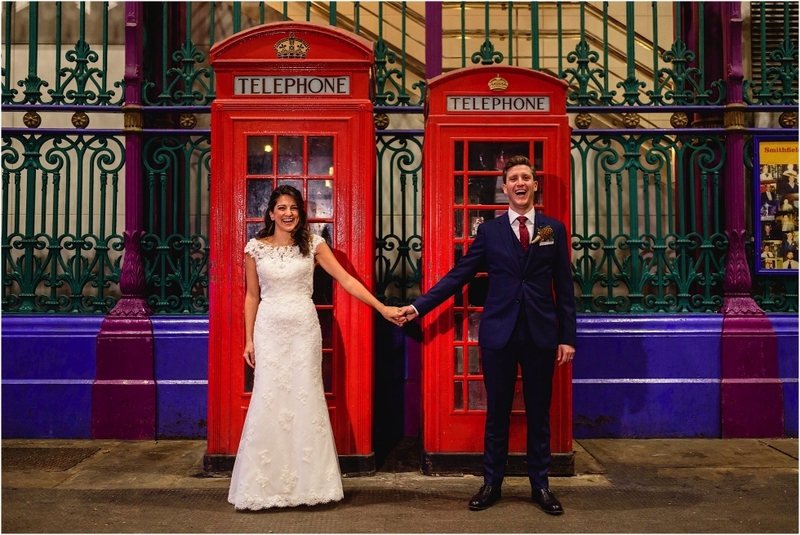 The quintessentially British telephone boxes in front of the colourful railings of Smithfield Market make an ideal backdrop for group shots and couple portraits. Although St Bart’s doesn’t have any outdoor space, this spot is less than 5 minutes walk from the venue. There’s also a small park opposite too. All parts of the day were great but my absolute favourite bit was the evening party. They hired DJ Jason King who was fantastic! When some specially selected Lebanese tunes came on party erupted! Hankies were waved, shapes were thrown and there were big smiles everywhere. It was a lot of fun! Lily, Greg, their family and friends were an absolute joy to get to know and it was a really pleasure to capture their happiness. Thanks guys for asking me to be your St Bart’s Brewery Wedding Photographer! The full wedding gallery and slideshow is available to view for friends and family. Please ask Lily or Greg for the password. 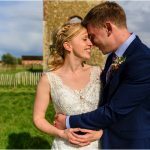 I’m a Norfolk Wedding Photographer who travels all over the place capturing lovely weddings. 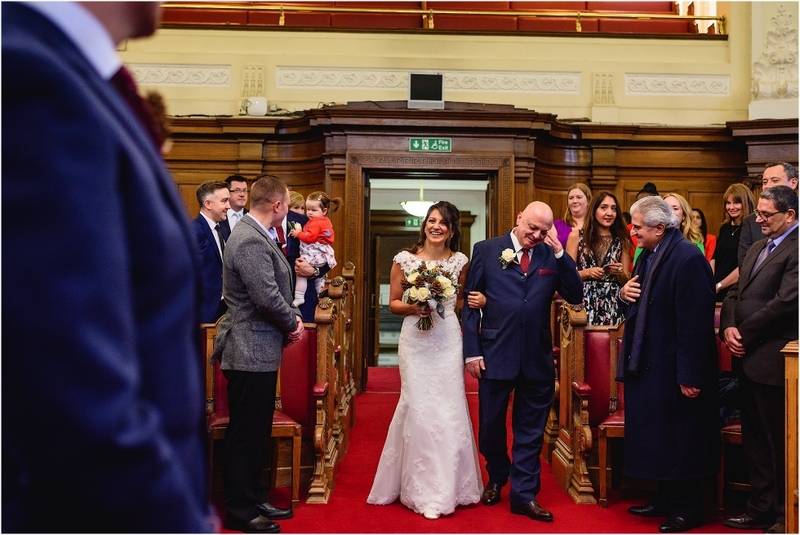 I often shoot as a London Wedding Photographer too. If you’d like a St Bart’s Brewery Wedding Photographer, or a wedding photographer for anywhere in the UK or further afield, please get in touch!